It’s difficult to avoid Zombies in this day and age; that’s not to say that the undead are actually walking the streets but the genre itself has certainly taken on a life of it’s own. From George A. Romero’s iconic series of movies all the way up to comedies such as Shaun of the Dead and through to the film adaptation of World War Z, Zombies are here to stay, even if they are decaying a bit. 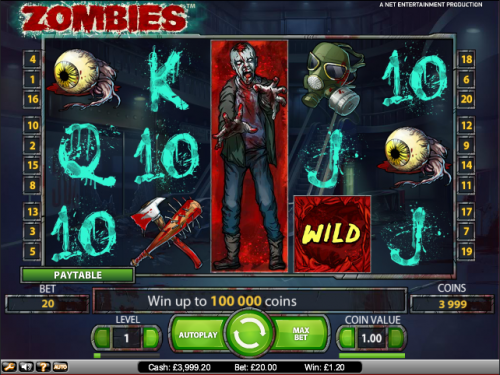 The Zombies online slot is produced by Net Entertainment who are one of the leaders in creating stunning-looking games and this is no exception. There’s enough gory, head-chopping action here to keep most horror fans satisfied and there’s also a funky bonus game. 10, J, Q, K and A are the low value symbols but there’s a gory selection of higher value ones including an axe/baseball bat, an eyeball, a brain, a gas mask and a blood-soaked chainsaw. The scatter symbol is a green vial of antidote and there’s a blood-red wild which expands into a full-size zombie. This is the main feature and it’s triggered by landing three of the green vial scatter symbols on reels two, three and four. You’ll now get five free spins which may not sound like much but in between each spin you’ll get a cut scene showing you blasting the undead with a shotgun in a shopping mall. As the spins progress the Zombies shuffle slowly towards you and each one you shoot wins you a cash prize. If you get a big win a Zombie will appear right in front of you just before his head is hit by a meat cleaver. In the actual spins, the multiplier increase each time in the following sequence – 1x, 2x, 3x, 5x and 10x. Stacked wild symbols appear on reels three and can cover the whole reel or just one or two parts of it. If it competes a winning combo, it will shift up or down to cover the entire reel. If you don’t win anything on a particular spin there’s always a chance of the Random Wild appearing changing up six symbols into wilds. Zombies easily lives up to Net Ent’s high graphical standards and it also features some suitably creepy sound effects. It’s all good fun though and fans of Net Ent slots will not be disappointed. The twenty paylines are fixed so the minimum stake is £0.20 and the maximum per stake is £200.